This eco friendly cooler bag is great for carrying hot or cold items. It is made from non-woven, polypropylene material with the look, feel, strength and quality of a cloth bag. The insulating material is constructed of polyester fibers and coated with thermal film. 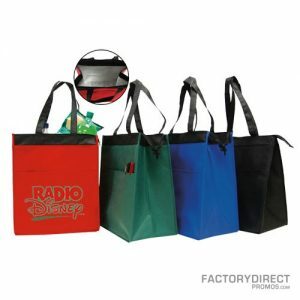 The Promotional Cooler Bag also includes a front pocket, zipper closure, and reinforced handles.